There is nothing quite as revitalizing after a hard day at work as kicking off your work shoes and putting on your dancing shoes! 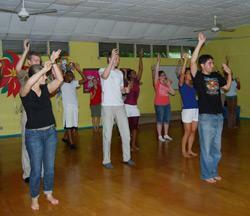 Our volunteers in Jamaica regularly have the chance to attend typical Jamaican reggae dance classes. The dance teacher, Pencil man, ensures that the volunteers learn all the latest dancehall moves. Last week Pencil man demonstrated the moves meticulously by explaining, ‘ok let’s go…1,2,3 put your left foot forward, 1,2,3 do a spin…, then he shouted leggo de music’ (time to freestyle and show your moves). The volunteers have a great time learning reggae dancing and are now well qualified to show us all the latest dancehall crazes including ‘shell de dung’, ‘de swagger’, ‘skip top ma lou’, ‘sassa step’ and ‘ruba bounce’. Volunteers, ‘uno had it lack, tek it to do worl’!